The EVIDENCE2e-CODEX Project will be co-ordinated by a team from the Institute of Legal Information Theory and Techniques of the Italian National Research Council (CNR-ITTIG) led by Dr. Maria Angela Biasiotti, who has successfully been involved in international projects since 2000. The co-ordination team will be supported by a project office both at CNR-ITTIG and the University of Groningen. 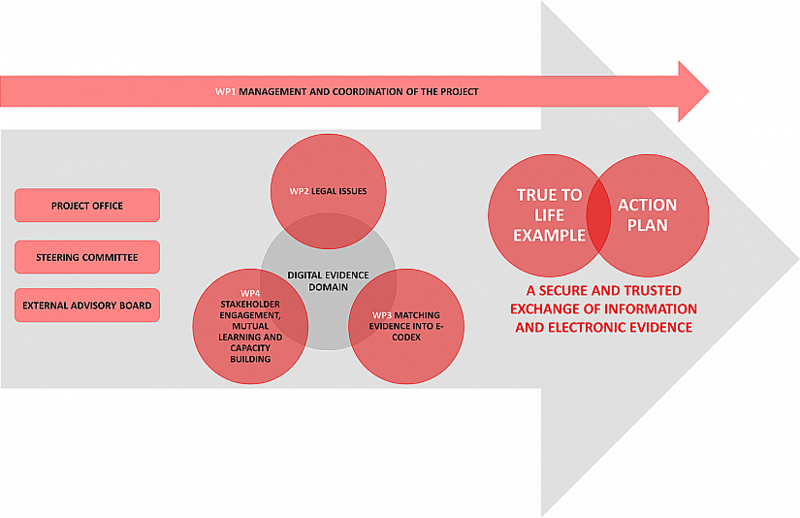 CNR-ITTIG will be overall responsible for the financial and scientific management of the EVIDENCE2e-CODEX project and it will be supported by the work package leaders (with specific responsibilities) and a Steering Committee. For the purpose of internal evaluation as well as external expert feedback, the organisational structure also includes an External Advisory Board (EAB). Dr. Maria Angela Biasiotti has a degree in Law (1999) and holds a PhD in Information Technologies and Law (2008) at the Faculty of Law, Bologna University. In 2001 she started her activity at the Institute of Legal Information Theory and Techniques (CNR-ITTIG). She collaborates also with the European University Institute. From 2009 she is responsible for CNR-ITTIG in the ORAAl project aiming at realizing and online observatory on Food Law financed by the CNR. She collaborated in several European Projects: SMART – Scalable Measures for Automated Recognition Technologies; EVIDENCE – European Informatics Data Exchange Framework for Court and Evidence (Project Coordinating Person); RESPECT – Rules. Expectations & Security through Privacy-Enhanced Convenient Technologies; CARE – Citizens Consular Assistance Regulation in Europe (supporting the Co-ordinator in the management of the project); Multilingual thesauri Matching Project financed by the OPOCE; Caselex Project financed by the European Commission under the e-Content and later e-Ten program, specifically working at the building up of semantic tools (metadata and thesaurus) for retrieving case law and selecting relevant cases for the repository; NormeinRete Project realizing and ABC for the Law helping users of the portal to access in a conscious way legal contents. She combines a robust practical experience in the area of law (she has practiced as a lawyer in public law, administrative law and EC law for an Italian leading law firm) with a broad knowledge in the field of ICT and law. Her main research areas involve: legal informatics, computer law, legal information modelling and accessing, and legal information documentation management and dissemination. She is the author of many scientific works and contributions presented at international conferences. She organized conferences, workshops and summer schools in her domain of research and activity.